Linked battery charging was introduced by PAG and is unique to the PAGlink system. Now you can charge more batteries on fewer, smaller and more efficient chargers. PAGlink makes charging easier and more economic. 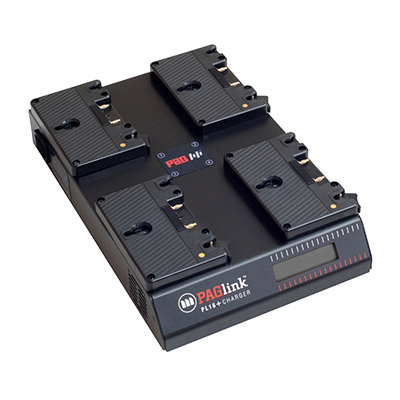 The 4-position PAGlink PL16+ is the ideal workshop charger for broadcast organizations and rental companies. It greatly reduces the number of chargers required to manage a large PAGlink Gold Mount Li-Ion battery inventory. The batteries can be of any rated capacity and in any state of charge for linked charging. PAGlink intelligent batteries manage their own charging automatically. 8 fully-discharged 94Wh batteries will be fully-charged simultaneously in less than 12 hours; 16 batteries in less than 24 hours. 150Wh PAGlink batteries will take 50% longer. 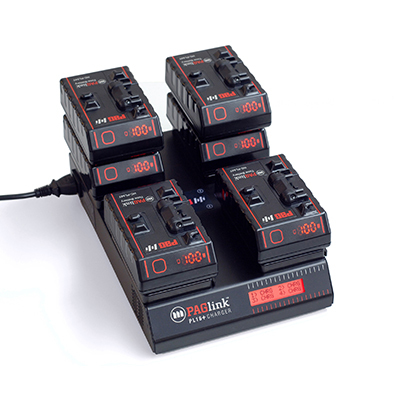 The PL16+ features 4 charging positions, which enable you to charge a mix PAGlink and non-linking Gold Mount Li-Ion batteries, manufactured by PAG. It features 4 charging positions which enable you to charge a mix PAGlink and non-linking Gold Mount Li-Ion batteries manufactured by PAG. 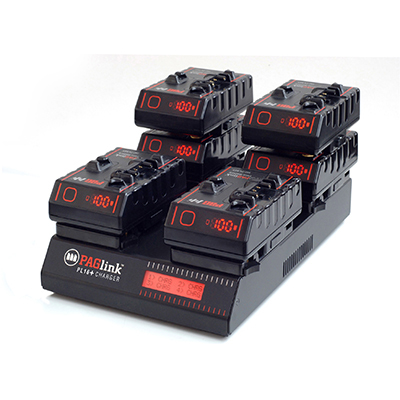 PAGlink batteries communicate their individual state-of-charge to the charger. The most discharged batteries are given priority until all the batteries reach a similar state-of-charge. The batteries are then charged simultaneously, using available current in the most efficient way, until they are all fully-charged together. Fully-charged batteries stop accepting charge automatically and can be left safely on the charger until they are needed. During charging, the percentage state-of-charge of each PAGlink battery is indicated on its individual display. The battery’s numeric display can be inverted, for legibility, with a single button press, and reverts automatically after removal. The stages of the charging process for each channel are clearly indicated on the charger’s large backlit LCD screen. An automatic recovery feature is included for deeply discharged batteries. Additionally, the charger will automatically reset Li-Ion batteries if their cut-out has been tripped. The PL16+ is compact, quiet and cool-running, and features a hard-wearing aluminum case. It weighs only 3.5lbs and its slim design makes it easy to transport. Battery Connectors: 4 x Gold Mount. Li-Ion Intelligent Parallel Charging program: maximum output 6A at 16.8V (100W approx.). Up to 8 PAGlink batteries per channel may be charged. Batteries can be in any state-of-charge. The most-discharged batteries will be given priority. Fully-charged batteries stop accepting charge automatically and independently of other batteries. An automatic Recovery Charge Program enables deeply-discharged batteries to be charged. Additionally, the charger will automatically recover a Li-Ion battery where the output has been shut down. Monitors the battery under charge, monitors the charger’s own functions, and shuts down to a safe condition should any tests fail. 100V to 265V AC. Frequency 50-60 Hz. Maximum consumption 220W. Protected against short circuit and excess battery voltage. Should mains failure occur during a charging program, or whilst the charger is connected, it will shut down to a safe condition. The charge status of each PAGlink battery is indicated by its own display. The different stages of the charging process are indicated for each channel on the charger’s LCD screen. The charger is fully automatic in operation. Operating Temperature Range: 0ºC to +40ºC (+32ºF to +104ºF). The times given are for fully-discharged to fully-charged 94Wh batteries equally distributed across four channels. 150Wh batteries will take 50% longer.